'Toons: Bill Mitchell zeroes in on Saddam Hussein. WASHINGTON (Feb. 18) -- In preparing the nation for a possible war with Iraq, President Bill Clinton faces a series of obstacles, including a skeptical Congress and less international backing than President George Bush enjoyed during 1991 Persian Gulf War. So far, Clinton has the public's backing: two-thirds of the nation approves of how he is handling the crisis, according to the latest CNN/USA Today/Gallup Poll. But that can't obscure the fact that the United States appears ready to strike at Saddam Hussein's rogue state without any unanimity of opinion on what the goal of an attack should be. Should the U.S. merely try to punish Hussein for his latest intransigence over U.N. weapons inspections? Should it try to seriously diminish his ability to develop weapons of mass destruction? Should it actually try to topple his regime? In his speech at the Pentagon Tuesday, Clinton laid out a modest goal: diminish the Iraqi threat. That probably is within the United States' reach, but it's no answer for the long term, and it's less ambitious than some earlier administration pronouncements. "If Saddam rejects peace and we have to use force, our purpose is clear," Clinton said. "We want to seriously diminish the threat posed by Iraq's weapons of mass destruction program. We want to seriously reduce his capacity to threaten his neighbors." After the quagmire of Vietnam, Americans deserve the clearest possible explanation of the reasons and objectives for war whenever the nation edges toward one. So far, Congress has been silent on a possible conflict with Iraq. Lawmakers left for their Presidents' Day break without endorsing a possible military strike, because they couldn't agree on wording acceptable to both political parties. Lawmakers are able to speak with one voice to condemn Iraq's failure to abide by U.N. resolutions, but opinion on Capitol Hill splits after that. Some legislators worry about giving Clinton a Gulf-of-Tonkin-style "blank check" for the use of military force, and others seem intent on mounting a decisive effort to remove Hussein from power. 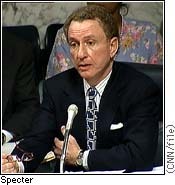 In the meantime, Sen. Arlen Specter has urged Clinton to hold off on military action until Congress, which returns next week, can offer its counsel. "Bomber and missile strikes constitute acts of war," Specter said in a letter to the president. "Only Congress has the constitutional prerogative to authorize war. The Congress spoke loudly last week by not speaking at all." Clinton also faces a divided public. In the latest CNN/USA Today/Gallup poll, 54 percent of people surveyed said they would prefer to see the Iraqi crisis resolved by diplomatic pressure and economic sanctions. Maybe more importantly, though, the poll indicated a significant drop since early February in support for military strikes against Iraq, from 50 percent to 41 percent. At the same time, by about a 2-1 margin, people say if the U.S. does attack, its goal should be remove Hussein, not just to reduce Iraq's capacity to develop weapons of mass destruction and threaten its neighbors. 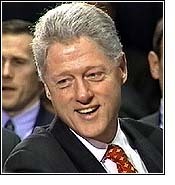 And Clinton has another problem, and her name is Monica Lewinsky. In this public test of wills with Hussein, Clinton has tried to stake out the moral high ground. He has talked about "the chance to do the right thing for our children and grandchildren." But some of his political opponents think Clinton cannot claim the moral high ground, not now, not after the past month's lurid tales. As restrained as Republicans have been in discussing the Lewinsky controversy, there are signs that approach is ending. In a visit to Iowa Monday, Sen. Bob Smith of New Hampshire, a potential presidential hopeful, suggested that Clinton had lost the "moral authority" to order air strikes against Iraq. "He has a severe credibility problem. He has it with the media. He has it with the American people.... If he can't tell me the truth about this, is he telling me the truth about Iraq?" Smith said. Diplomacy may still work. 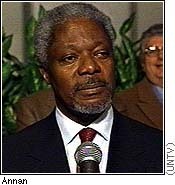 U.N. Secretary-General Kofi Annan is headed to Baghdad this week in a last-minute attempt to avert a U.S.-led attack on Iraq. But if the nation moves even closer toward war, Clinton may find that to win political support, he needs to spell out in greater detail -- and probably on national TV -- the U.S. goals and why he believes air strikes can achieve them.